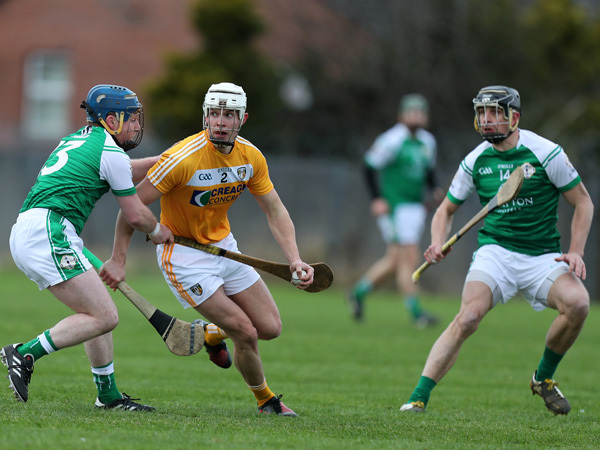 ANTRIM’s hurlers made a winning start to their Division 2A campaign when they defeated London by seven points in Corrigan Park yesterday. However, the Antrim footballers endured a 0-23 to 1-7 loss to Offaly in Tullamore on a weekend of contrasting fortunes for the Saffrons. A strong second half performance proved crucial for the hurlers on a cold and windy day in West Belfast. Playing with the elements in their favour, the hosts led by just three at the turnaround having hit 11 wides in the opening half, but they took full control after the break to pull away from the visitors. “In the first half I thought we were very lethargic and we told them that at half-time,” said Antrim manager, Dominic McKinley afterwards. “The second half we started the way we should have with a lot of energy and closing people down with a lot of aggression and I think we took control of the game. We would be disappointed with the first half and the amount of wides we had. They were taking shots from places where they shouldn’t be shooting and that was something we were focusing on. But in the second half we were much better. Antrim led 0-9 to 0-6 at the break and the Exiles would have fancied their chances with the wind behind them in the second half. Yet, Antrim were much-improved and outscored the visitors 0-7 to 0-1 in the third quarter with Ciaran Clarke on-song from frees while Conor McCann and substitute, Deaghlan Murphy chipped in with further scores. London finished well to narrow the gap slightly but the Saffrons were home and dry by that stage and deservedly picked up two points ahead of next Sunday’s trip to Carlow. Meanwhile, Antrim’s footballer are in a relegation battle after losing their opening two games in the National Football League. Yesterday’s 13-point defeat in Offaly leaves the Saffrons as the only side in the Division Three without a point. The hosts were ahead 0-9 to 0-4 at the break, and pushed on at the beginning of the second half – hitting eight points without reply. Jack Hannigan, Antrim’s sixth and final substitute, was black-carded within seconds of his introduction meaning the visitors had to play the last 10 minutes with 14 men. Matthew Fitzpatrick bagged a late consolation goal for his side but Frank Fitzsimons and Gearóid Adams will be hoping for a vastly improved showing when Antrim host Sligo on Sunday, February 26.